Not one but two Irvine Teeth in a Day Seminars held on 8⁄25 - 8/26/2018. Learning about Permanent Teeth in 1 Day for Orange County residents. Seminar advantage scheduling a Free Exam, X-Ray & 3D CT Scan. Irvine, CA - Get excited Orange County! If you have trouble attending a seminar then there are no more excuses. 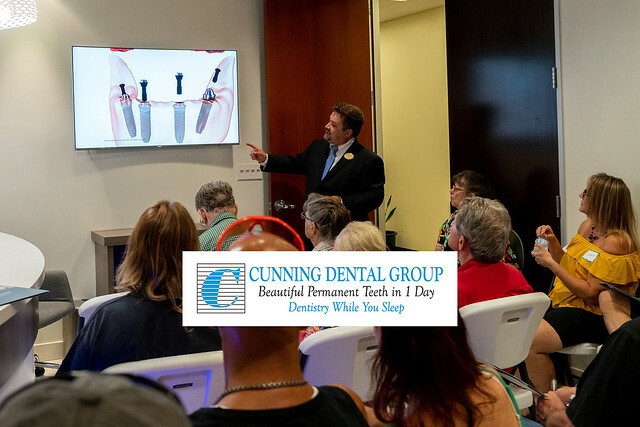 Cunning Dental Group just hosted the first ever back to back seminar at their Irvine office! The Permanent Teeth in 1 Day Seminar was scheduled for Saturday and Sunday August 25-26, 2018. Patients that attended the seminar were thrilled that they had two great options to learn about how they can get new, fixed teeth. If they couldn’t make it on Saturday, patients had the chance to attend Sunday. The whole point of the seminar is to help educate patients on this amazing state of the art cosmetic dentistry procedure. Not only do patients learn a lot about the procedure but they get a chance to ask questions directly with the dental team. As a bonus, Dr. Cunning is a frequent guest speaker at these events so patients are pleased they got a chance to meet him. Step 1: It all starts with our Free Exam & X-Rays. Step 2: If you have a lot of missing teeth, broken teeth, infected teeth or if you wear dentures and have no teeth then we’ll schedule a 3D CT Scan. This will help us determine if you are a candidate for the Teeth in 1 Day procedure. Step 3: Our experienced dental team will then put together your treatment plan with the latest 3D computer simulation to give you the best new smile possible! Once you get your treatment plan you are ready to schedule this life changing procedure. Step 4: Your Teeth in 1 Day Surgery date becomes your new birthday which combines precise surgical techniques with new aesthetic replacement teeth. Step 5: Since it takes a few months for the dental implants to fuse to the bone, your new fixed provisional teeth are installed. Soft foods are recommended during this stage as you gradually build up to harder foods. Step 6: You’ll be checking your new smile in the vanity mirror since you’ll look great but at this time we want you to take it easy and let the healing process do its thing. After a few months the dental implants have fused to your bone and you can start the final step. Step 7: We unscrew your provisional teeth and replace them with permanent, stronger teeth. The gums have healed and the new fixed teeth function and look like natural teeth. Enjoy! Learn more about the steps to get you new, beautiful permanent teeth. How do I schedule an exam for Teeth in 1 Day near me? We have 3 Teeth in a Day locations in Southern California. Please call us at (855) 328-6646 or schedule an exam online. Hope to see you soon! Photos from the Back to Back Irvine Teeth in 1 Day Seminars.